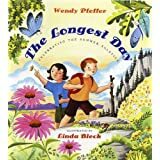 I came across this book, The Longest Day: Celebrating the Summer Solstice by Wendy Pfeffer, illustrated by Linda Bleck. I presented it to my daughters about two years ago as the longest day of the year rolled around. At the time, they were probably a bit too young to really understand and appreciate the book, but today–at 5 and 7 years old–they curled up next to me as I read from the colorful pages. And now that most kids are out of school for the summer, it may just be a good time to introduce the reason why we have summer in the first place. And that is just what the “teacher” will be talking about here on Practical Parenting…with a Twist for the next couple of weeks. Summer is important: warm sunshine and extra daylight makes a perfect time to grow the food we all eat all year long. 5,000 years ago, in England “mystery builders” constructed Stonehenge out of huge bluestones and sandstones–bigger than a school bus and heavier than 8 elephants–to create a sort of sundial. In some cases, the rocks were hauled over a hundred miles to the location where Stonehenge was built using ramps, ropes, and rollers. But why?! No one really knows…but they do suspect is all had to do with celebrating the sun. Here’s a tidbit new to me: America has it’s own version of Stonehenge. It’s called “Mystery Hill” and is nestled in the woods of New Hamshire. While Stonehenge is neatly arranged with precision, Mystery Hill is a jumble of stones, many of which are etched with ancient inscriptions. Perhaps it was built by an ancient civilization? On the summer solstice, visitors flock to Mystery Hill to watch the sun rise over Sunrise Stone, commemerating the year’s longest day. Yet, in Wyoming, thousands of folks hike up “Medicine Mountain” to see the Bighorn Medicine Wheel. Scientists and archaeologists believe the Plains Indians cinbstructed this 80-foot wide circle out of rocks between 200-800 years ago. Twenty-eight spokes radiate out of a central hub. One spoke points to the summer solstice sunrise, and the other to the summer solstice sunset. Next week, on The Teacher is Talking, we’ll share some more myths and celebrations of the summer solstice around the world. For now, go out and enjoy some sunshine!